I’ve heard folks utter those words too many times. Is God really a great vending machine in the sky? We just put in our tithes, add faith the size of a mustard seed, and voila…God comes through. He gives us the job we want. Makes the sun shine on a cloudy day. Whatever it is we think we need, God will give it to us. Right? When a man asked Jesus to heal his son, Jesus reminded the man “all things are possible for one who believes.” But Jesus never promised that believing or having enough faith would mean healing here on earth. When healing doesn’t come, it isn’t because someone lacked faith or doubted or didn’t believe. It doesn’t come because God has a different plan. Jesus’ victory was won through the cross. The cross that looked like defeat became Jesus’ greatest victory over death and sin and hell. I pray that prayer daily. Sometimes more than once a day. I do not doubt that God can heal my foot. He created this universe and knit me together in my mother’s womb. So I don’t need more faith. I just need faith that trusts God is using even a crazy sore foot for His glory and honor. God please take this from me, but if not may Your will be done, for Your glory, that Your Name will be honored, that people will come to know You as Lord and Savior, that Your Spirit sweep away injustice, and Your grace and mercy will be spread throughout the world. Father I confess too often I want You to be a vending machine. I want You to give me what I want for my service, tithes, and faith. Forgive me for thinking I could ever force Your hand. Instead help me to pray like Jesus did. Help me to ask you for what I want, but lay it down trusting Your will. Give me eyes to see how Your Name could be glorified and honored when Your will and mine coincide, but even more so when they differ. May You receive all glory and honor so that many may know You as their God. In Jesus’ Name I pray. Amen. 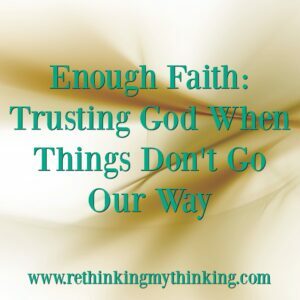 This entry was posted in Rethinking Christian Life and tagged Christ, Christian, Faith, God, God's will, Jesus, prayer. Bookmark the permalink.